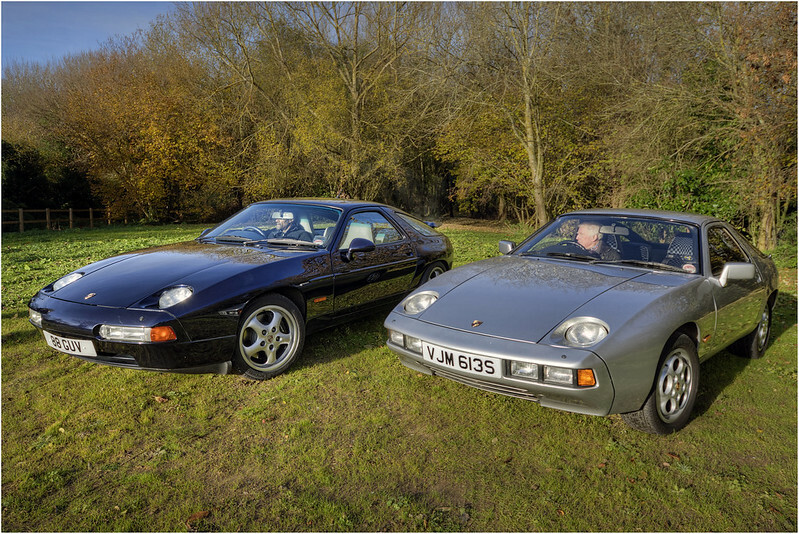 The last Saturday in November saw the 15th annual gathering of Porsche 928 cars at the Merry Miller pub which was organised by Andrew Brierley. There were 35 cars in attendance including the first and last UK registered which provided a nice photo opportunity. 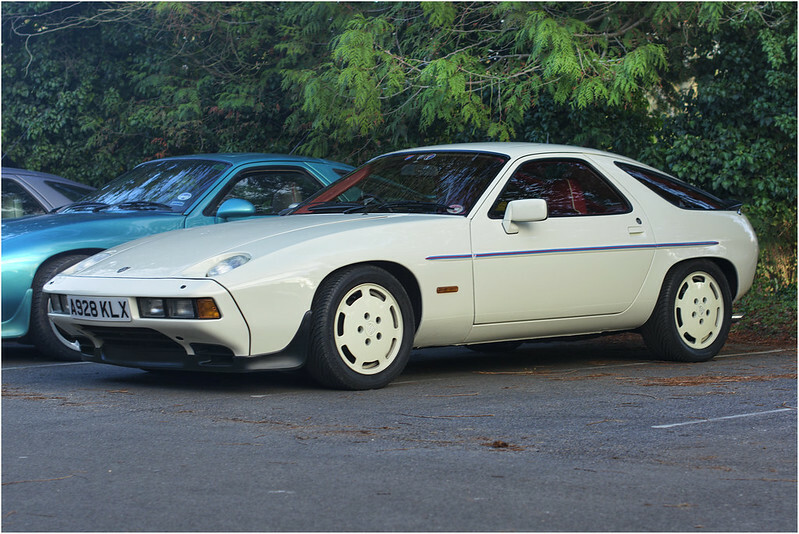 Andrew also organised a couple of competitions, one for the favourite car at the meeting and the other for guessing how much it has cost Andrew to maintain his own 928 for the last 13 years not including paint and tyres. Prizes were a $100 credit to spend with Roger Tyson of 928srus.com. 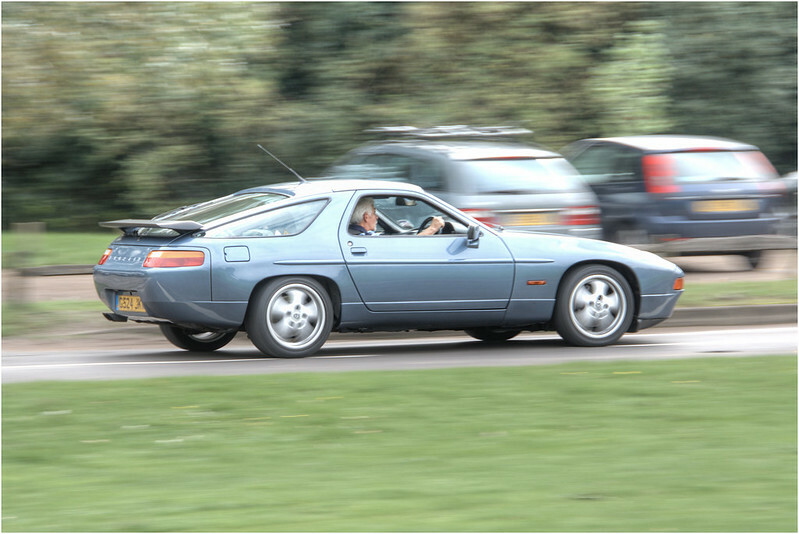 The runner up prize was £50 toward parts from Simon Watson and a 2014 Porsche 928 calendar. Barry Barton won favourite car for his Chiffon white S2 with red leather interior and white piping. The car also has interesting gulf colours along the rub strips and matched painted wheels. The runner up was John Vaughan for his immaculate 1978 Silver car pictured below. Trevor Peddle guessed £18,565 which was the closest to Andrew’s maintenance costs of £16,998.18 and Bill Robertson was runner up with his guess of £19,101.32. “Thanks to everyone who turned up at the Merry Miller today, I counted 35 928s, a good turnout helped by the great weather. It certainly made my 350 mile round trip easier driving in decent weather conditions.” - Andrew Brierley. Philip Rickard must take the prize for the longest distance travelled as he came from Cumbria and that is probably around 280 miles each way! It was pretty cold outside but the food and warm open fire in the pub was very nice indeed. I heard recommendations for the raspberry crème brulee and cheesecake. The first and last registered UK cars. The 16th annual meeting will no doubt take place on the last Saturday in November 2014 so put that date on your calendar and come along. 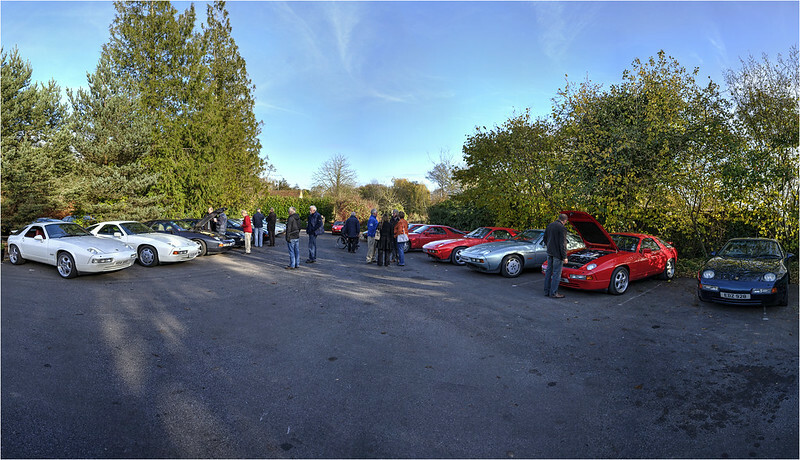 The 13th annual meeting took place in Tilford, Surrey as it does every year on the first Saturday in October. It's arranged by Stewart and Sue Wren, they probably arrange the nice weather too. It’s the largest gathering of the Porches 928 in the UK each year, taking place on the green opposite the Barley Mow pub. In total around 52 cars attended. The distinctive V8 sound rumbled around the green as visitors came and went. Every model and almost every colour was represented from the earliest very well cared for silver car owned by John Vaughn through to S2, S4/GT and GTS models including the last one registered in the UK. Chats between owners and visitors spilled into the pub over lunch and a beer (or two). Richard Armstrong filled up the AC systems of several cars leading to happy people and cool interiors. The green keeper thanked everyone for the £160 from donations for the future care of the cricket pitch. If you brought your car along, thanks! If you didn't why not try and make it next year, I am sure Stewart will book great weather again and the chat, beer and food are all very good. It’s always the first Saturday in October so mark your calendar now! Jim Gaisford took some very good pics of the trackday last week, with a few 928s included! The real surprise was that at about the 4000rpm point, all the cars had exactly the same power figure! After that, the cam profiles of the two GT cars (mine and Joe's) separated us from the auto's. Although all the cars pulled pretty good power curves, I thought they were all slightly down compared to what I have seen on previous occasions at the same venue. Mine, for example has pulled 338 estimated bhp before, but only hit 331 today. Several factors contribute to the varying figures from day to day, but the real benefit of today was the comparison of all the cars together. Each month there are more than 10,000 visits to the site. 928.org.uk is built in Joomla! It ran on my Xserve since from 2006-2013 and from 2013-2017 on RefHat Openshift and then back briefly on my Xserve again after it was the subject of sustained attack by script kiddies. It is now hosted professionally in a UK datacentre by a specialist Joomla! hosting company.